Annah Kyomukama is one of the stars on the Gorilla Highlands Trails. 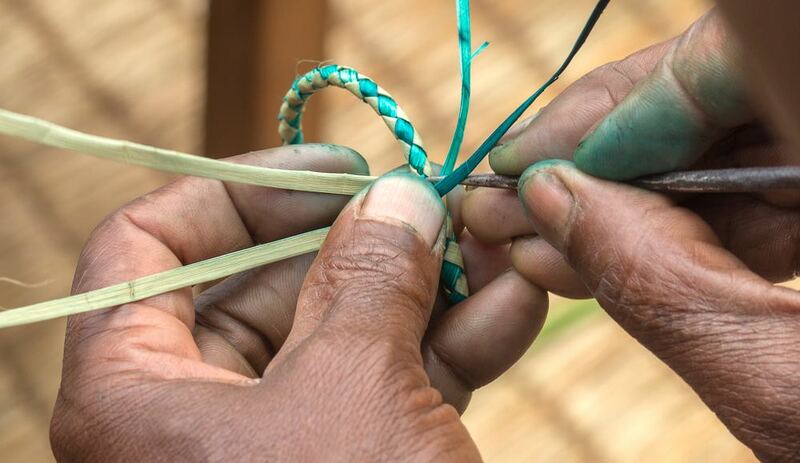 There is hardly a trek that doesn’t include a visit to Annah for a practical lesson on craftmaking that often includes delicious local lunch. But most significantly, Annah is an example of a strong local woman. 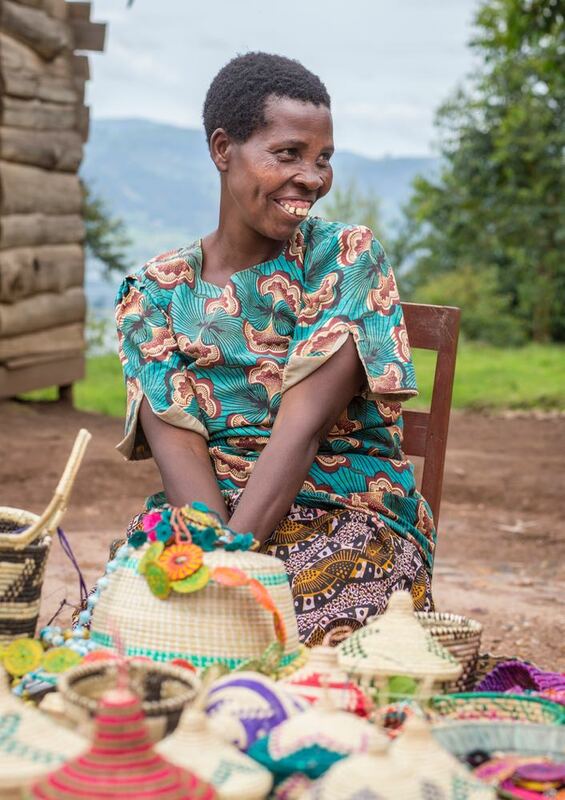 A widow and a mother of 10, she has built a future for her children with the dexterity of her hardworking hands. How did you start making crafts? When I was 12 years old I started to learn about crafts from my mother. She told me how to make simple crafts like baskets for home use, not for selling. In 2006, when Edirisa began teaching women how to produce and improve their crafts, I got the skills to sell them. We learned how to make different designs, using different colors and patterns. 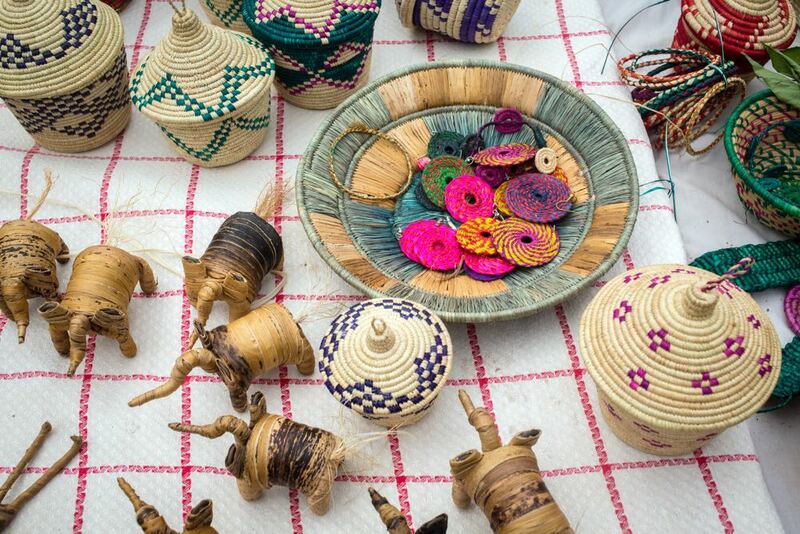 The project was started by Pamela Kanyunyuzi who would buy crafts for personal use. The woman who sold her the crafts told me about it. So I went to Pamela asking which kind of crafts she was looking for and joined the project. She took pictures of crafts she found interesting and showed them to us. We tried to study how to make them and how to get the same material. During this project we opened different shops in Uganda: in Kabale, Fort Portal and at Bunyonyi Overland. I became a major person behind this project coordinating other women from different areas. When Edirisa decided to focus on other work, Edirisa UK took over. At the end we were 18 women involved. Why do you like this work? I have always had interest in crafts. After school I wanted to produce better ones with better materials. That is still my dream. I like working on my own and not for others. What are your main projects at the moment? Now I am just working for Edirisa’s Gorilla Highlands initiative, not with Edirisa UK anymore. Sometimes they send me some orders, but that is all. Through Gorilla Highlands hikers come to my place, see and buy my crafts. I am also selling some crafts to the craft shops around. How does your working day look like? My working hours depend on the orders and my tasks. When I have an order I work from 7am to 6pm, with one hour for lunch break. If I don’t have an order I also work in the field. My target is to primarily sell to the people who visit me, so I always need to have some crafts at home. In the high tourism season I might sell on four days every week. In the low season there is sometimes a month without selling anything and without any orders. How many crafts to you produce in a day? Depends on which crafts I am working on. If I work on simple ones I can make about 20 a day. If it is a basket it takes some days, depending on the size. A small basket takes me two days, a medium one four days and a big one a week. Where do you get materials from? I collect some papyrus from the lake and I can buy two colours in Kabale. Other material, for example raffia grass and different colors I need to get from Kampala, sent by my son. Which crafts do you like to produce? Do you have a bestselling product? My clients mostly like table mats, earrings and baskets. I love to work on earrings because they are fast and easy to make. Producing baskets is exhausting but good for selling. Once a man bought five baskets and his brother wanted to have the same five baskets, thus I had to work on that order for many days. So far I have only received positive feedback from my clients, nothing negative to mention. Are you setting the prices for your products? I am the one who buys the material and puts the effort in, so I am also setting the prices for my products. If someone wants to buy more but can’t afford, I try to make a good price. In general I try to be fair so everyone can buy from me. Do you teach other people in your community? Yes I do. I am teaching my children and except one, who doesn’t have the patience for it, they are all learning crafts. I am also teaching other women so they are getting the chance to sell crafts. Do you have collaborations with other partners? How do you market your crafts? I would love to cooperate with other people but I am spending all my money on my kids and their school fees. I would love to have a shop in Kampala or at a different place and work together with other people who are selling crafts. I would like to learn about new materials and how to make clothes. But I don’t have enough money for all that. Do you entirely depend on the craft production or do you have another source of income? The money I receive from selling crafts is not enough, that’s why I also go to work in the field to produce some food for my family. I would need a lot more purchasers to have enough income for me and my family. And that is hard to reach because the market is limited. What do you think about tourism? * The interview was conducted during the pre-election time.